What a difference a year makes. In 2017, this game was abandoned due to torrential rain, and the Chief’s match at the Nevill was almost waterlogged the following day. This year we played at Sheffield Park in glorious sunshine at their lovely ground. This was the first match that the Junior Armadillos had ever played, and it was a terrific game played in a wonderful spirit. Many of the boys knew each other from various connections including school, and the variety of academic establishments represented include Eastbourne, Ardingly, Hurst, Eton, St Edward’s, Tonbridge, Cranbrook, Rugby, St Lawrence Ramsgate and Kings Canterbury - what a great spread. The Armadillos won the toss and asked us to bat first, which was a pleasant surprise. The opening pair of James P and Alex R were going nicely with a partnership of 21 before James was caught behind off Ollie Nolan for 14. He has had a good season for the B.B. so far and still has 2 more years. The original plan was to open with Rupert, but the logistical difficulties of finding the ground meant he was a little late, so he came in at number three. Unfortunately did this didn’t last very long as he was bowled by a good ball from the other Armadillo opener. Alex (7) continued to defend well on a tricky pitch, showing plenty of application and put on 20 with Tom N (20). There followed a middle order collapse as Alex, Tom (bowled by a snorter that nipped back a long way through the gate), Felix and Rory were all out in a short space of time for just 4 runs. 46-6. Rufus P consolidated well with Hugo, despatching the bad ball brutally as they put on 27 in seven overs. Unfortunately after he was bowled, we were running short of support for the Captain, who was stranded on 39 not out. We closed on 111 all out with 6 overs left to bat. After a memorable tea, which was as comprehensive as one could wish for, we opened the bowling with Rufus and Rory. They both very economical but without initial success. Oli made an immediate impact with his third ball to remove Ellis (bowled) with the score on 23. This brought Alex Crickmore to the crease, who had not played for a while. Unfortunately we were not able to capitalise on his rusty batting, and he somehow got through a difficult patch against Oli, Harry, Tom and Isaac eventually getting to 50* at the very end. Our fielding was mixed, with some catches going down, yet a very smart pair taken by Rory in the deep and Tom at mid wicket. Isaac picked up the important wicket of Will Hanley LBW, but unfortunately despite swapping the bowling regularly, the captain did not have enough runs to play with. I think another 30 or 40 could have made this a really interesting game. The Armadillos won with 10 overs to spare by 6 wickets - they played the better cricket and were stronger than us on the day. However it was a great day for them on their inaugural match, and I sincerely hope this will become a regular fixture in our calendar. We have already pencilled in July 31, 2019 for the next instalment at Sheffield Park. Please do put that in your diaries. Batting mentions to Hugo, Tom, Rufus and James, who all made double figures. Bowling mentions to everyone who bowled - we just didn’t have a big enough total to defend. Thanks as always to everyone who came to support and we move onto our final game against the adults at the Nevill. Junior BB 204-4. Won by 6 wickets. Designed as a triangular day with Sussex and Hampshire, but ended up being a really enjoyable all day game just against the Martlets. We were able to play an old style 'declaration game' which produced a genuine result and some terrific cricket. Well done to all the boys. This was a real team performance, with everybody contributing in some way. Even James Pollington, who was unfortunately due in next, took a vital catch at deep mid wicket to make the initial breakthrough when they have made a really good start at 49-0. Captain Hugo Pettman lost the toss and they elected to bat. The new ball bowling of Luke Berry (5.3-0-26-1) and Ellis Winsper (6-0-24-0) was a little wayward, and we were guilty of not bowling to our off side field as much as we would like. Tom Pollington (3-1-12-0) also tried some seam bowling before Hugo turned to his spin quartet. First up was Tom Nicholls and Felix Fleming. Felix bowled a great economical spell (6-0-11-0) and was extremely unlucky with two or three chances missed in the field (including one of his own bowling). He was brave enough to pitch the ball up and did not get his just rewards and will have luckier days. Tom (15-0-55-4) got the initial wicket of Ed Fairfax (27) well caught by James Pollington, and then proceeded to take regular wickets, including the dangerous no 3 Harry Moorat bowled off an edge. This was an excellent spell of bowling and he could not quite get his 5-for. Isaac (5-1-30-3) replaced Felix with his left arm bowling, and benefited from some wonderful catching for two of his wickets. Hugo plucked a stinger out of the sky for a brilliant grab at short mid wicket, and Jonathan Shepherdson dived to his right at extra cover for a cracking catch. Hugo (8-1-31-2) himself bowled ether side of lunch and importantly removed the young and highly talented Toby Shepperson (54) immediately after lunch, well caught above his head by Luke Berry. So 9 consecutive wickets for the spinners, and at 167-9, we were well and truly in the driving seat. However a spirited last wicket stand of 36 with some strong hitting tipped the balance more to an even game. Luke finally removed their no 11 Harry Drew for a fine 21, and they were all out for 203. We had been really quick in the field and bowled 50 overs in just over 2 1/2 hours - good to see and meant that we would get enough overs to chase the target. We opened up with Tom Pollington (25) and Nico Bryan (57), who got off to an excellent start. Tom hit some lovely boundaries, especially on the legside, whilst Nico played second fiddle in their partnership of 39. After Tom got a top edge to square leg, Jonathan Shepherdson joined Nico up to tea. He played really well, solid in defence and producing a glorious cover drive which had the veterans in the pavilion purring. They put on 40 together before Jonathan was out soon after tea for 17. Young Ollie Streets joined Nico, having kept well again in their innings, and showed a really good technique in defence, as well as some lovely attacking shot too. He was unfortunate to be stumped off the leg spinner for 10, however his innings was important as we did not lose quick wickets. All this time, Nico had progressed serenely to his well earned 50, with 10 fours and some fabulous on drives. When he was out after 27 overs, we still needed 90 to win and left 2 new batsmen at the crease in Hugo P and Ellis W. The game was in the balance. However the school friends showed great composure and maturity to play themselves in steadily - at one stage they scored just 4 runs in 5 overs - but once they broke the shackles they batted beautifully together. Hugo (44*) was especially severe on the leg side, whilst Ellis (37*) played shots all round the ground. They also ran really well between the wickets to put pressure on the fielders. They put on 90* together and saw us over the line with about 7 overs to spare. Terrific batting and a splendid result to win by 6 wickets. Champagne moment - that is probably a tie between the catches of Hugo and Jonathan off Isaac's bowling. Man of the match - a number of excellent individual performances from Tom, Isaac, Hugo, Ellis and Nico, this was really a great team win so I would like to share it between everyone. We move on to Belmont and the final game of the (rain affected) 2017 Junior BB season against the adults. Thanks as always to the boys, and those who came to support and drive them. It is much appreciated. Junior BB (203/6) v Shepway Stragglers - Match abandoned. Well it seems that the weather is doing its best to thwart us this week. We lost the game on Monday to rain against the Hoggets, and Wednesday's match against the Chief was curtailed. On Friday, rain was forecast to arrive late afternoon, however it never really left us and despite trying to squeeze a game in, we only managed four overs of their innings before it became too heavy to continue. However there were some very promising aspects to our batting. Having lost the toss and been asked to bat first, we opened up with the Tonbridge pairing of Alex Moen and Charlie Oster. This could well be a first, as Charlie normally bats at 10 or 11, however he showed for too much skill to remain that low down the order in the future. His timing was terrific and he hit some lovely boundaries before he was caught for 13 at second slip off the accurate Nick Wright. There was quite some considerable doubt about whether this was in fact a bunk ball - the umpire at the bowlers end was not sure at all - however Charlie took the catcher's word and walked off. Rory Pritchard was looking to improve on his innings against Leeds, but was caught on the back foot by a quick single from Alex and was never likely to get home. He was run out for 1. Captain George Wooldridge (21) had his father keeping behind him but didn't let this distract him. He hit 5 lovely 4s before unfortunately he was again attracted to spin and was bowled by Nick Healy trying to come down the wicket. Freddie Falcon was also looking to hit over the top and was caught at mid on off Nick for 9. This brought Hugo P to the crease to join his old chum Alex. After a scratchy start, where he survived thanks to some streaky edges, Hugo played a terrific knock in difficult conditions, visibly growing in confidence. He and Alex put on 49 before Alex was caught at mid wicket for 47 looking to accelerate. It was was a another lovely innings looked extremely solid and in good form. This brought in Will Falcon, just as the rain was getting heavier. After an initial break and delay, when tea was taken, we decided to shorten the game which left us five overs to complete our innings. Will came out on fire and smashed 32 off 14 balls with some clean hitting - the partnership was 53 off 26 balls. 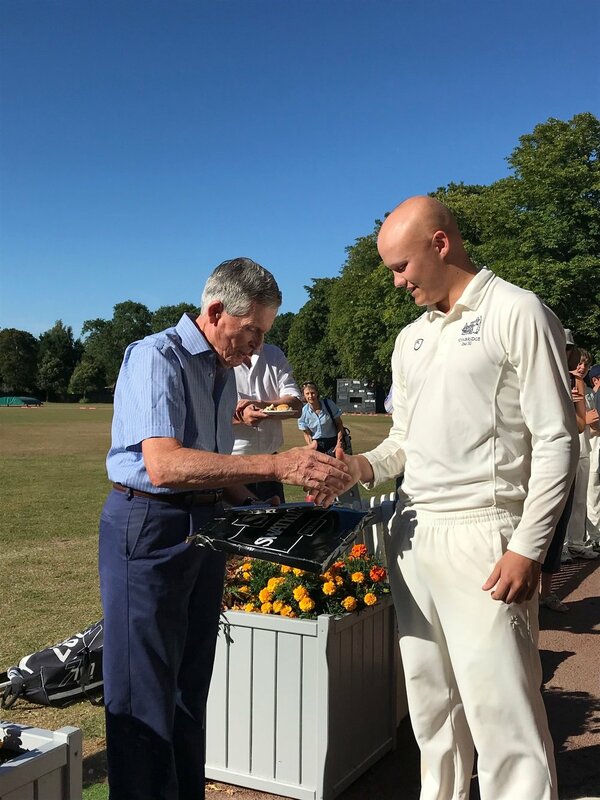 With Hugo's acceleration (54*) and Benny Smallwood's wonderful improvisation (14*) with scoops over the keeper, we were able to finish on 203-6 off 32 overs, which the Stragglers were chasing off 25 overs. Alas the rain was getting heavier and heavier, and after just four overs from Will and Sean, during which we created more than one chance, it was too wet to continue. We shook hands and headed home. I am really sorry that couple of the team did not have the chance to do very much, notably Oli, Rufus and Sean, but thanks for your support and understanding. So we move onto the last few games this week, and thanks again to all who came to support and watch. Special thanks to Seb Pollington for sharing the umpiring duties with me on a pretty grim day. Junior BB (138/7) beat Leeds & Broomfield (84 all out) by 54 runs. After the frustration of the match against the Hampshire Hoggets being abandoned by rain, the Junior BB got off to a winning start in the 20 match at Leeds. At this beautiful and picturesque ground overlooking Leeds Castle, we lost the toss and were asked to bat first on a green and sporty wicket, which had been freshened up by the overnight rain. We didn't get off to the best start, as Captain Rory Prichard was LBW to a swinging delivery after only three balls, closely followed by a frustrating run out for Freddie Falcon. Felix Fleming hit a lovely boundary to backward point, however he was undone by an excellent yorker, which left us 14-3. However we consolidated well with Benny Smallwood (28) and Tom Nicholls (37) pouncing on some short bowling from the seamers and spinners, to put on a crucial partnership of 64 in eight overs. They hit 11 fours and a six between them and got us back on track. This momentum was continued at the end of the innings with some fine hitting and aggressive running by James Pollington (16), Albert Courage (15*) and Isaac Wallace (15*), with Isaac hitting 2 lovely maximums to the leg side in the closing overs. We closed on 138/7, which was considerably more promising than it looked at one stage. Just as last year, Leeds & Broomfield had 4 really strong players, and their wickets would be the key to the game. They included Harry Houillon who was playing in the U15 Bunbury Festival recently. He is a fine (although talkative) keeper, who times the ball really well. I thoroughly enjoy watching Ed Shepherdson open the bowling for first time (3-1-4-1) and had the best view as the umpire. He generated excellent pace and bounce and when he dismissed the other opener for 0, the score was already 22–1. At the other end Rufus Pullen (3-0-26-0) had little luck with the new ball but caused numerous problems. Captain Rory Pritchard bravely turned to the leg spin of Tom Nicholls (2-0-11-1), who came round the wicket to produce a cracker to bowl Harry for 23. This was crucial. Thereafter Louis Moen took 3-10 showing the virtues of building straight, as 2 were LBW and the other bowled. Louis was replaced by the left arm spin of Isaac Wallace. Again, this was the first time I had seen his bowling, and in his very first over he produced a remarkable hat trick - caught at cover, bowled and then stumped by Benny Smallwood to much joy. Albert Courage, another debutant, finished off the innings and we had won with 22 balls to spare. So a really pleasing win and an excellent all-round team performance with everybody making a contribution. Man of the Match must go to Tom Nicholls for his powerful batting to top score with 37, and the key wicket of Harry Houillon. Honourable mentions to Benny Smallwood, Louis Moen and Ed Shepherdson. Champagne moment has to go to Isaac Wallace for his hat trick delivery. This is a rare feat and something to celebrate. The first match of the 2017 Junior BB season was against the Junior Martlets. Last year we had a convincing win at Hurstpierpoint, but this year they bought a decidedly older and stronger team. Unfortunately we were not able to match them and lost by 63 runs. The Martlets batted first at the picturesque Stonewall Park ground, which was kindly made available to us by the Fleming family. Sean Menary was extremely unlucky not to take a wicket in his opening spell (5-1-15-0) and it was Will Falcon made the opening breakthrough by producing a great Yorker to remove the blonde haired Margarson for 2. There followed a match winning 2nd wicket partnership of 121 between the bearded Futcher (73) and Moorat (50). They hit 23 boundaries between them and were especially ruthless on anything loose. Captain Alex Moen turned to spin, which was a brave decision given the short boundaries and big hitting. His faith was rewarded by wickets for Felix Fleming (2-54) and Hugo Pettman (3-35), aided by some fine catching from the skipper, who pouched 4 at mid wicket. Felix is only 15 and deserves real credit for keeping the ball pitched up and getting his success. The Martlets had power hitters down to no 7 and we did really well to restrict them to 219-7 in 40 overs, having been 134-1 in the 25th over. We began our chase with the experience of Tom Pollington and Alex Moen, who saw off the pacey but erratic openers with an excellent stand of 49. All seemed to be proceeding well, however Tom was out in the 13th over, and despite a fine 42 from captain Moen and a promising first appearance for 14 year old Ollie Streets, we were falling behind the rate. Only Will Falcon (20) and Sam Huggett (24) provided any real resistance in the middle or lower order by hitting boundaries, and we fell short with 5 overs to spare. So we will be hoping for better things next week in our matches against the Hoggets, Leeds & Broomfield, Chief's XI and Shepway Stragglers, but an enjoyable game played great spirit. Champagne moment today would have to go to the Captain for his wonderful reflex catch off Felix to break the second wicket partnership at short mid wicket from a fierce drive. Man of the Match? Probably spread around the team with several good performances with the ball - Hugo's 3-35 with his leg breaks, Will Falcon's 2-25 and Felix Fleming's 2-53. Then Alex Moen (42), Tom Pollington (25), Will (20) and Sam (24). Thanks to everyone for their effort and support and look forward to seeing you in the next two weeks.